In order to understand the three-dimensional structure of DNA, it’s convenient to think of DNA as a ladder-like molecule with a very regular structure as shown below. The hydrogen bonding between base pairs is responsible for forming the regular structure with antiparallel strands. The double-stranded helix forms as a result of interactions between adjacent base pairs. This interaction consists of van der Waals attractions and it causes the base pairs to come together so that they are in close contact. The result is a stack of base pairs, one on top of the other, with hardly any space between them. The usual term for these interactions are stacking interactions and they are the main force that holds the two strands together in a helical form. The interior of double-stranded DNA is very hydrophobic which is just a fancy way of saying that water is excluded. Unlike proteins, the formation of double-stranded DNA is not an example of an entropy-driven hydrophobic effect, Instead it is enthalpic contributions in the form of stacking interactions that drive the reaction. However, the hydrophobic interior is essential because it stabilizes and protects the hydrogen bonds between the bases. These hydrogen bonds would not form if they were surrounded by water molecules since each of them could just as easily be replaced by hydrogen bonds with water. The structure of the normal B form of DNA is shown on the right. B-DNA is a right-handed helix which means that if you think of it as a spiral staircase you will be turning to the right as you descend. Left-handed helices are found in some other rare forms of DNA. The width of B-DNA is 2.37 nm (nanometers) and it varies by only a small amount with base composition. The distance between one base pair and the next is 0.33 nm, on average. This is called the rise as in the risers on a staircase. Some of the strongest reflections in the X-ray diffraction pattern of DNA are due to this repeat of 0.33 nm. The space between stacked bases is exaggerated in the cartoon (right). The pitch of the helix is the distance to complete one turn of the helix. This value is usually given as 3.40 nm but it varies somewhat depending on base composition. On average, there are about 10.4 base pairs per turn of the helix in B-DNA and the angle of rotation between adjacent base pairs is about 34.6°. 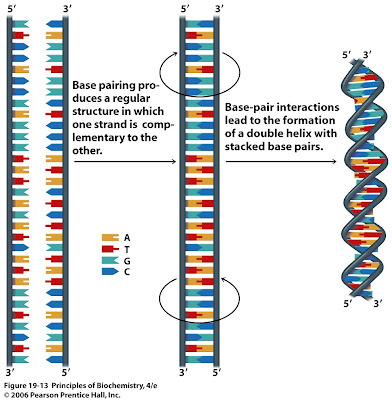 The double helix has two grooves of unequal width because of the way the base pairs stack and the sugar–phosphate backbones twist. These grooves are called the major groove and the minor groove. Within each groove, functional groups on the edges of the base pairs are exposed to water. Each base pair has a distinctive pattern of chemical groups in the grooves. Because the base pairs are accessible in the grooves, molecules that interact with particular base pairs can identify them without disrupting the helix. 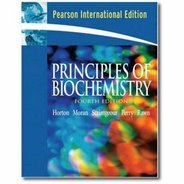 This is particularly important for proteins that must bind to double-stranded DNA and “read” a specific sequence. 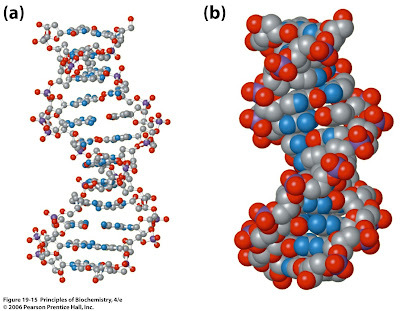 Two views of B-DNA are shown below. The ball-and-stick model (left) shows that the hydrogen bonds between base pairs are buried in the interior of the molecule where they are protected from competing interactions with water. The charged phosphate groups (purple and red atoms) are located on the outside surface. This arrangement is more evident in the space-filling model (right). The space-filling model also shows that functional groups of the base pairs are exposed in the grooves. These groups can be identified by the presence of blue nitrogen atoms and red oxygen atoms. The length of double-stranded DNA molecules is often expressed in terms of base pairs (bp). For convenience, longer structures are measured in thousands of base pairs, or kilobase pairs, commonly abbreviated kb. Most bacterial genomes consist of a single DNA molecule of several thousand kb; for example, the Escherichia coli chromosome is 4600 kb. The largest DNA molecules in the chromosomes of mammals and flowering plants may be several hundred thousand kb long. The human genome contains 3 200 000 kb (3 x 109 base pairs) of DNA. 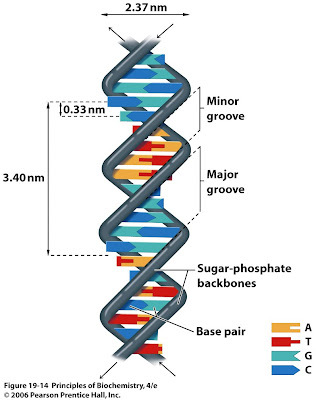 I have a question on DNA grooves. We define the grooves as distance between C1 to C1 of next paring nucleotide where the distance is greater, it would be the major groove. And we know that the grooves alternates as we go along the double helix. My question is when few nucleotides make the major groove with their fixed geometry..how in the next groove (minor groove), they change into different geometry, shorter distance.! Can we have several grooves of one type, let say major groove in row!